Mary E. Searls, 91, died Friday. March 22, 2019 at her home in Iowa City. attended Coe College and Cornell College. Mary met James "Jim" Searls in elementary school and were later married December 21, 1947 in Evanston, Illinois. They were married for 70+ years. The couple moved their family to Iowa City in 1962. 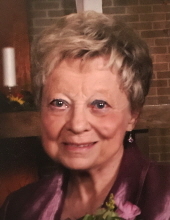 Mary worked as a teller and bookkeeper at the Postville Bank, as a receptionist at the U of I College of Dentistry Pedodontics, secretary at Roosevelt Elementary in Iowa City and as a teller with Iowa State Bank in Iowa City from 1965 until her retirement in 1990. She was a member of Chi Omega Sorority and a member of P.E.O. Chapter KP. Mary enjoyed gardening, especially tea roses, sewing and was an excellent cook. Mary and Jim spent countless hours supporting their children’s, grandchildren's and Great Grand’s activities. Mary is survived by her children, Trish Campanelli (Joe), Jim Searls (Carol), Tom Searls (Dan Mears) all of Iowa City and Bill Searls of Coralville; grandchildren, Chad Campanelli (Donna), Gina Campanelli, Joey Campanelli (Konetta), Courtney Nelson (Todd), Jackie Searls, Kimberly Bales (Danny), James “Butch” Searls, Jesse Searls (Jessica), Kari Searls and Sam Searls; great-grandchildren, Isabelle, Rae, Collier, Harrison, Haleigh, Gavin, Camden, Lyla, Burton, Blakely and Holland and a brother, Charles “Chuck” Eberling (Ginger) of Hattiesburg, Mississippi. Mary was preceded in death by her parents, her husband and a sister Carol Eberling. The Searls and Campanelli families wish to thank Iowa City Hospice for their loving care and support in Mary’s final days. To send flowers or a remembrance gift to the family of Mary E. Searls, please visit our Tribute Store. "Email Address" would like to share the life celebration of Mary E. Searls. Click on the "link" to go to share a favorite memory or leave a condolence message for the family.